Volunteering at the APRL in Honor of Martin Luther King, Jr.
Penn State MLK volunteers opening boxes of philatelic literature donations. 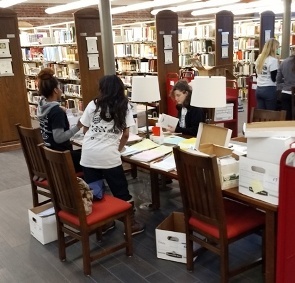 One of the more rewarding experiences at the APRL are when we are fortunate enough to have volunteers come to the library to help us with various tasks. 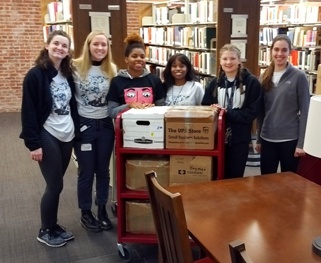 One such occasion happened this past Monday when a group of students from the nearby Pennsylvania State University gave of their time to come for a visit and to volunteer in the library as part of a Day of Service in honor of Martin Luther King, Jr. Upon arriving at the American Philatelic Center in the late morning the students were given a brief tour of the building and then shown some tasks in the library keeping busy until the late afternoon. Volunteers sorting and re-boxing philatelic literature donations. 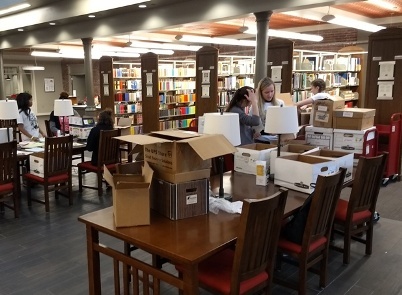 While they were here they assisted us by sorting the many boxes of philatelic literature donations that we receive each day in the library that had been taking up space in various locations. The donations were sorted, re-boxed and then labelled according to the various formats we receive such as books, journals, auction catalogs, price lists, names sales, and show programs, to name just a few. In all with the student’s efforts, 35 boxes of miscellaneous donated material were organized into 20 boxes of sorted philatelic literature. After a busy Day of Service and a job well done. We wish to thank the Penn State Martin Luther King, Jr. Day of Service Commemoration Committee for organizing the visit and also the students who generously came to volunteer and honor Dr. King with their Day of Service at the APRL.